Experience the Highlights of Vietnam and Cambodia. 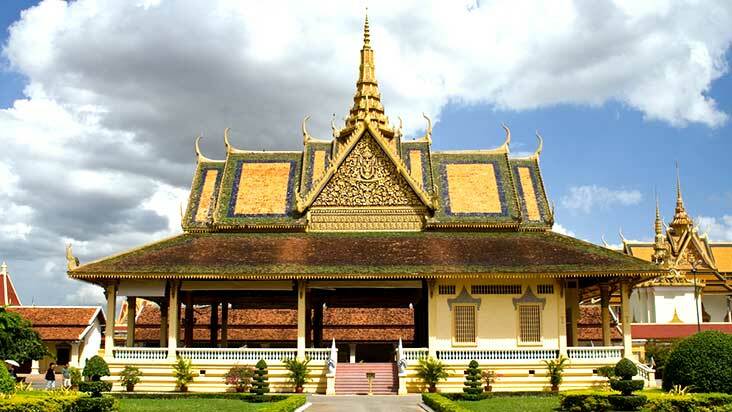 Starting in the riverside capital of Cambodia, Phnom Penh, long considered the most beautiful French built city of the Orient, explore the Royal Palace and Silver Pagoda, the haunting Tuol Sleng Museum and the Killing Fields of Choeung Ek. Travel to Siem Reap and the fabled city of Angkor, eighth wonder of the world and spectacular ancient capital of the powerful Khmer Dynasty. Discover temples such as Angkor Thom, Ta Prohm, Banteay Srei, Beng Melea and the breathtaking Angkor Wat. 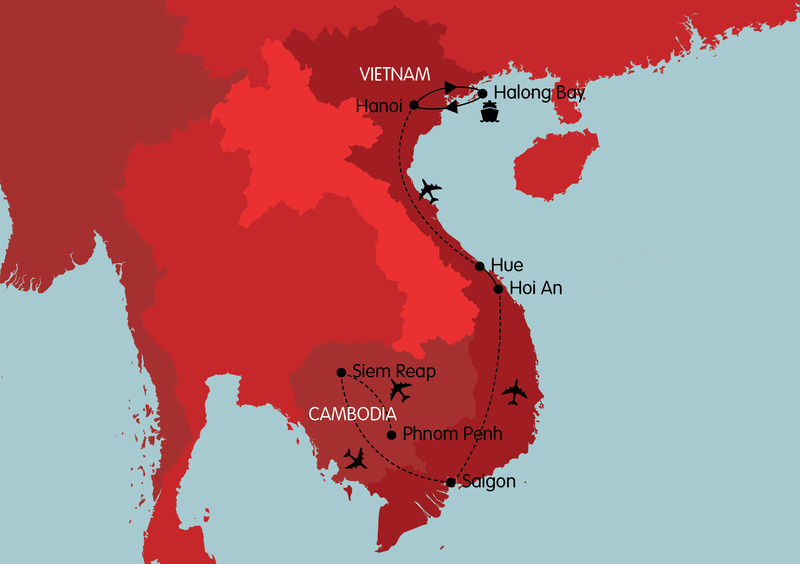 Continue to Vietnam starting in Ho Chi Minh City (Saigon) in southern Vietnam, a sprawling metropolis with its Vietnam-American war history including the Cu Chi tunnels, and a day trip to the bustling Mekong Delta. Visit the charming old merchant town of Hoi An with its rich architectural fusion of Chinese, Japanese, Vietnamese and European styles, laid back atmosphere and nearby sandy beaches. Explore the citadel and tombs of Hue, the ancient imperial capital before flying to Hanoi with its French colonial architecture and bustling old quarter. Depart from Hanoi for your cruise on breathtaking Halong Bay where thousands of limestone rock sculptures jut dramatically from the sea. Our Highlight itineraries cover the key attractions at a relatively quick pace. Enjoy them as they are or extend them to create your perfect holiday. Discuss itinerary options and extensions with our Asia Travel Experts. You will meet your guide on arrival, transfer and check-in to your hotel. During the drive your guide will provide an introduction to Phnom Penh, answer any questions you have, and make arrangements for the following day. Enjoy free time for the remainder of the day. The riverside capital of Phnom Penh, once known as “The Pearl of Asia” and long considered the most beautiful French-built city of the Orient, is a charming and captivating city. The old French ochre-coloured colonial buildings are now being filled with trendy cafes, boutiques and art galleries and many traditional ornate temples still remain. The bustling squares and frangipani-lined boulevards create an atmosphere that is unlike any other city in South East Asia. Rich in history, Phnom Penh has a number of cultural and historical sites including the National Museum, Royal Palace and Silver Pagoda, and offers an insight into its darker past with the haunting Killing Fields and Tuol Sleng Museum. Phnom Penh has many great restaurants and bars including the rooftop bar of the iconic Correspondent’s Club, an ideal spot to sit and watch the sun descending over the Tonle and Mekong rivers. Ask your guide for personal recommendations. Itinerary Option: If you’re arriving to Phnom Penh in the morning, discuss additional day 1 activities with our staff. Set out with your guide to visit the National Museum, designed in traditional Khmer style by a French archaeologist and painter in 1917. The museum houses Khmer art and sculptures from different periods of Cambodian history. Next visit the Royal Palace and the Silver Pagoda, built in 1866 by the French for King Norodom, two of the most striking buildings in the capital and amongst the finest examples of Khmer architecture. The Royal Palace stands on the site of the former citadel dating back to 1813 and is home to the current King Sihamoni. The Silver Pagoda owes its name to its floor made up of 5,329 solid silver tiles. The building houses many gold and jewelled Buddha statues including the 17th century Baccarat crystal Emerald Buddha. Other important buildings found within the compound include Wat Preah Keo Morokat where Royal ceremonies are performed, and the King Ang Doung Stupa - the burial site of former King Norodom. 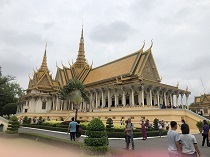 The palace has been inhabited by kings at all times with the exception of the period when the radical Khmer Rouge party took control in 1975. Learn about the turbulent years of the Khmer Rouge on your visit to the infamous Tuol Sleng Museum. Tuol Sleng, a high school prior to 1975, became an interrogation prison known as S-21 during the Khmer Rouge era and today it is a genocide museum. It tells the sad story of the thousands of innocent Cambodian people who were tortured on its grounds. Walk the narrow corridors and former classrooms as you read the stories of the victims and witness the torture devices on display. Photographs were taken of each prisoner passing through the prison and hundreds of the black and white photos are now on display in the museum. Although a haunting experience, the museum is a sobering reminder of the Khmer Rouge’s brutality and a testament to their crimes. Return to your hotel or to one of the riverside cafes or bars to watch the sunset over the Tonle and Mekong rivers. In the morning fly from Phnom Penh to Siem Reap and meet your guide on arrival. During the drive your guide will provide an introduction to Siem Reap and answer any questions you have. Siem Reap, situated in the north west of the country, is an enchanting town with Chinese-style shop houses, French colonial architecture and tree lined boulevards. It is the gateway to the World Heritage ancient temple ruins of Angkor, eighth wonder of the world and spectacular ancient capital of the powerful Khmer Dynasty. As well as the myriad of awe-inspiring temples and Khmer relics to explore, Siem Reap and its rural outskirts offers craft villages, silk farms, Khmer cuisine cooking classes, traditional Cambodian “apsara” dance performances and the floating villages on the tranquil waters of Tonle Sap Lake. Accompanied by your guide start exploring the stunning temples this afternoon by tuk-tuk. Visit Angkor Thom, the ancient fortified royal city and former capital of the Khmer Empire. The city has five monumental gates and consists of several temples including the Bayon, Baphuon, Terrace of the Elephants and Terrace of the Leper King. Enter Angkor Thom through the impressive South Gate and drive towards the centre piece, the Bayon Temple. At first glance the temple may seem like a shapeless mass of stone, but further scrutiny reveals the enigmatic faces of former King Jayavarman VII looking in every direction. There are over 200 huge carved faces that stare down from fifty four gothic towers. Continue your exploration with a visit to the 350 metre (1155 feet) long Terrace of the Elephants, which served as a platform from where the King viewed the victorious return of his army. Then visit the Terrace of the Leper King with detailed carvings winding along a narrow passage that leads to the Baphuon, a pyramidal representation of mythical Mt Meru. After your afternoon tour you will be driven to your hotel and your guide will assist you with checking in. Before leaving you at your hotel, your guide will make arrangements for the following day and can also provide restaurant recommendations for tonight’s dinner. Explore temples of the World Heritage Angkor complex with your guide. Start with a visit to the picturesque and atmospheric Ta Prohm, built in 1186. This fascinating jungle-clad temple is one of Angkor’s most impressive and most beautiful structures. Over centuries the fig tree roots have engulfed the temple’s huge stone blocks, crumbling towers and walls. The living jungle is reclaiming this Buddhist temple, shrouding the courtyards and corridors in dappled sunlight, and creating a haunting and exotic atmosphere. In the afternoon, visit one of the world's most impressive archaeological sites, the iconic temple of Angkor Wat. The largest and most breathtaking of Angkor’s monuments, this vast temple was constructed between the 9th and 13th centuries and is the largest Hindu structure in the world. Angkor Wat is orientated towards the west, symbolically the direction of death. It is home to hundreds of beautiful carvings of Apsara and Hindu mythology and boasts some of the most well preserved carvings in the region. As you stroll the massive hallways you discover small shrines still in use today by the local people. Return to one of the grass terraces in front of the five massive towers of Angkor Wat to watch the sun setting over the temple complex. Afterwards, return to your hotel in Siem Reap. This morning fly from Siem Reap to Saigon. Meet your guide on arrival, transfer and check-in to your hotel. During the drive your guide will provide an introduction to Saigon, answer any questions you have, and make arrangements for the following day. Enjoy free time for the remainder of the day. Ho Chi Minh City (Saigon) in southern Vietnam is a sprawling metropolis of ten million people. Formally renamed Ho Chi Minh City in 1975 at the end of the Vietnam-American war, locals still refer to Saigon. With thousands of motorbikes zipping past luxury cars, French colonial buildings dwarfed by modern skyscrapers and traditionally dressed school girls riding bicycles past trendy city workers, Saigon is an exciting city of contrasts. Saigon is a city that never sleeps and offers a plethora of great restaurants and bars catering to all tastes, from street food vendors to the rooftop bar at the Rex Hotel, where international correspondents covered the Vietnam War and where the U.S. military attaché’s press briefing was held daily and dubbed the “Five O’clock Follies”. Whatever your interests, be sure to ask your guide for personal recommendations. The Cu Chi Tunnels are an immense network of interconnected tunnels near Saigon that are part of a much larger network lying below much of the country. A guided visit to these tunnels provides a better understanding of their history, the hardship of life underground and the resilience of the Vietnamese during combat. The tunnels were built and used initially by the Viet Cong guerrillas as hiding spots to protect them from the French air and ground sweeps. They later served as communication routes, storage facilities, hospitals and living quarters for the guerrilla fighters throughout the Vietnam-American war. You're invited to enter a section of the tunnels to witness the secrets of the tunnels firsthand. Your guide will also show you various mantraps employed from this period, the remains of an American tank and numerous B52 bomb craters. There is also the opportunity to fire an M60, M16 or AK47 rifle at the range next to the tunnel complex. 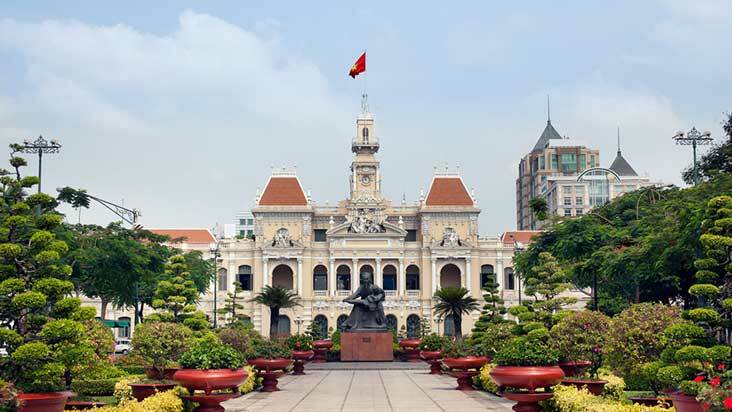 After returning to Saigon, learn about the historic landmarks as you tour the city with your guide. Visit the Notre Dame Cathedral, a red brick building with twin spires based on the original construction from Paris, then head across the square to the Central Post Office designed by the French architect Gustav Eiffel. Next stop is the former Presidential Palace, headquarters to the Saigon Government during the Vietnam-American war. You may also like to visit the War Remnants Museum for a vivid insight into the Vietnam-American war from a Vietnamese perspective. Skyscrapers are replaced by rice paddies and fruit farms as you travel by road into the Mekong Delta, the rice bowl of Vietnam. Witness daily life in the stilt houses and fish farms that you pass as your driver navigates the maze of canals in the traditional wooden motorboat. Experience the vibrant energy of the floating markets where vendors trade their produce between the floating boats in a uniquely Mekong Delta fashion. Sample freshly picked exotic fruits from a small island orchard as the farmer before lunch served in a traditional Mandarin house where four generations of one family live. Walk back or be rowed in a sampan to your motorboat to return to the pier before travelling by road back to Saigon. 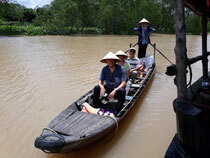 Fly to Hoi An where you will meet your new guide on arrival at the airport. First stop is the Marble Mountains, a cluster of five limestone and marble peaks that rise dramatically from the surrounding flat land. The local Vietnamese believe that the five peaks represent the five elements of fire, water, earth, wood and metal. Previously celebrated in the religion of the Cham people, the mountains were later used by the Viet Cong in the Vietnam-American war to monitor the US air base at Danang. The mountains contain many caves and tunnels. Climb the cut stone steps or take the elevator up to the top of one of the peaks, and explore the caves, temples and pagodas. There are panoramic views of Danang and the coast from the many lookout points. Continue on to the beautiful old merchant town of Hoi An. Built on the site of an ancient Cham village, Hoi An was a prosperous port from the 16th to 19th centuries trading with merchants from China, Japan, India, Indonesia and Europe who came to buy silk, spices and porcelain. Hoi An’s UNESCO World Heritage Old Quarter is beautifully preserved with ornate pagodas, antique trading houses and old tile-roofed shops. It is a rich architectural fusion of Chinese, Japanese, Vietnamese and European styles. Many of the historic buildings lining the canals and pedestrian streets have been converted into art galleries, boutique restaurants, bars and cafes. Hoi An is surrounded by attractive countryside with traditional farming and fishing, and by sandy beaches with modern seaside resorts. 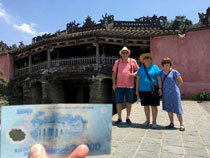 Experience the charm of Hoi An on a walking tour with your guide. Wander along the narrow lanes and gain an insight into Hoi An’s illustrious past as you explore this heritage listed town. Take in the old merchant houses with influences from Chinese, Japanese and Vietnamese architecture. See the 400 year old Japanese Bridge, a unique covered structure built by the Japanese, and the only known covered bridge with a Buddhist pagoda attached to the side. Visit the Assembly Hall of the Chaozhou Chinese Congregation with its outstanding wood carvings and explore the colourful market with stalls brimming with local specialties including silk which can be turned into fashionable garments within one or two days. Enjoy free time for the remainder of the day. There is plenty to see and do in Hoi An, but many visitors find themselves relaxing by the beach, browsing the markets and boutique shops, or visiting one of the many tailors in town. GetAboutAsia Favourite: Our customers rave about Hoi An, so check out our suggestions on personalising your trip to get the most out of your visit. A short cyclo ride takes you to the towering main gate of the UNESCO World Heritage Imperial Citadel. As you explore the grounds your guide will talk through the history of Hue, and you will be able to wander amongst the beautiful and ornate red lacquered pavilions of the Citadel, gaining an insight into the luxurious and secretive world of the court. Next stop is Thien Mu pagoda, Hue’s best-preserved religious monument, which stands on the riverbank with its impressive seven storey tower. The afternoon includes visits to Khai Dinh and Tu Duc Royal Tombs, and there is also the opportunity to visit an incense stick making house. 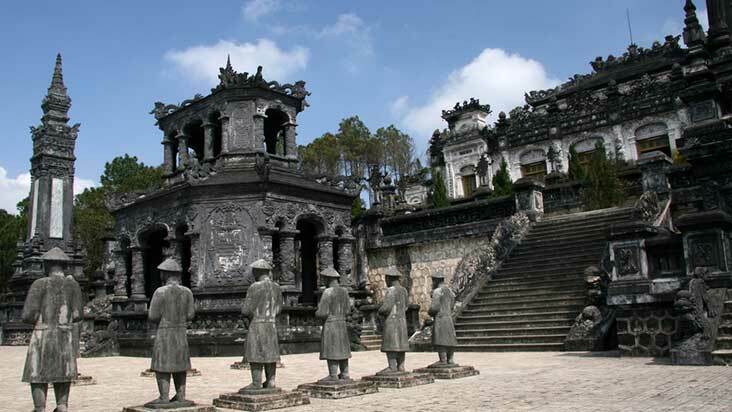 Visit Ming Mang Royal Tomb near Hue before transferring to the airport for your flight to Hanoi. Minh Mang was the second Nguyen Emperor whose interest in architecture brought major new construction to the Imperial City of Hue. His tomb is set in a large garden on the west bank of the Perfume River, with lakes and pavilions built in the old Chinese traditional style. You will meet your guide on arrival in Hanoi. During the drive your guide will provide an introduction to Hanoi, answer any questions you have, and make arrangements for the following day. Enjoy free time for the remainder of the first day. Hanoi is Vietnam’s capital city and home to seven million people. Traditional and refined, with French colonial architecture, tree-lined boulevards, scenic lakes and a bustling Old Quarter, Hanoi has a sophisticated charm. Observe elderly people practicing Tai Chi by the lake, with barbers and food vendors plying their sidewalk trade. Hanoi has many great restaurants with French, Vietnamese and international cuisines available. Ask your guide for personal recommendations. Accompanied by your guide, the day starts with a visit to the Ho Chi Minh Mausoleum, an imposing monument lavishly built using marble and granite, where the preserved body of “Uncle Ho” resides. See the lotus shaped One Pillar Pagoda which rests on a single stone pillar emerging from the water, and then explore the Temple of Literature, the first University for the sons of mandarins, to gain an overview of Hanoi culture and ancient Vietnamese architecture. In the afternoon, visit the Museum of Ethnology offering a fascinating insight into Vietnam’s 54 ethnic minority groups. Enjoy a walking tour through the bustling Old Quarter before ending the day with a show at the water puppet theatre – a uniquely northern Vietnamese art form depicting scenes of rural life and episodes of national history. Itinerary Option: Your guided tour can include alternate attractions like the Hoa Lo Prison (Hanoi Hilton), the Fine Arts Museum or the KOTO restaurant - a organisation that is supporting street kids with a career in the hospitality industry. Our staff can provide advice based upon your interests. Travel by road to Halong Bay wharf where you board a traditional junk boat to explore the UNESCO World Heritage Site of Halong Bay. Marvel at the dramatic vista and indulge in a seafood lunch onboard, as you sail amongst the thousands of limestone islands that rise from the turquoise waters of the Gulf of Tonkin. Rock sculptures jut dramatically from the sea and the numerous caves and grottoes have created an enchanting, timeless world. Return to Hanoi at the end of the day. GetAboutAsia Favourite: We know you’ll love Halong Bay so we’ve included suggestions to personalise your trip below. On your last day enjoy free time until your departure transfer. Phone now to discuss options to personalise your itinerary. Phnom Penh: Options include cycling trips, countryside visits to the Tatai waterfalls, and a visit to the Phnom Tamao wildlife rescue centre. 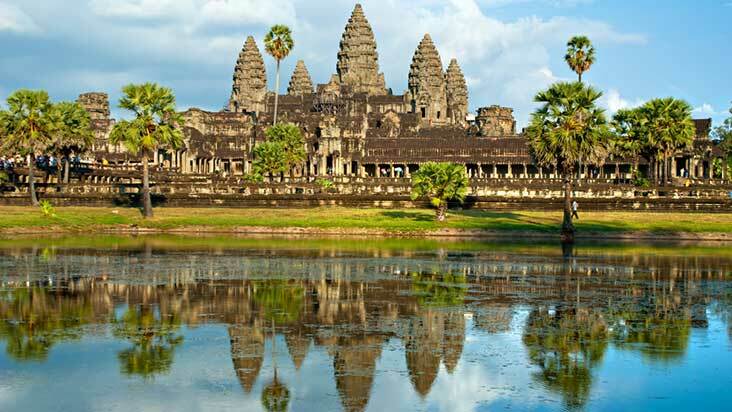 Siem Reap: Angkor includes a large number temples to visit, some well know and others off the beaten track. Some customers also like to spend an extra day wandering the temples on their own. Discuss options with our staff. Siem Reap: Other options include horse riding and quad bike tours, local handicraft visits, a silk farm visit, temple bike tours, and cruises on Tonle Sap Lake. Why not extend your trip to visit Cambodia's coast with great value beach resorts. Cu Chi Tunnels: Learn about life in the tunnels from a Viet Cong war veteran who lived here during the war. Saigon: Squeeze in a Vespa motor scooter tour. Options include street food tours, a wartime landmarks tour, an art and architecture tour, and a locals insider tour. Saigon: Add a cooking class to spice up your itinerary, either at the renowned Saigon Culinary Arts Centre, or an exclusive class at an historic villa. Saigon: War history tours, including itineraries that focus on Vung Tau and Nui Dat for Australian war veterans. Mekong Delta: Consider adding a night in the Mekong Delta to spend more time getting to know this fascinating area of Vietnam. 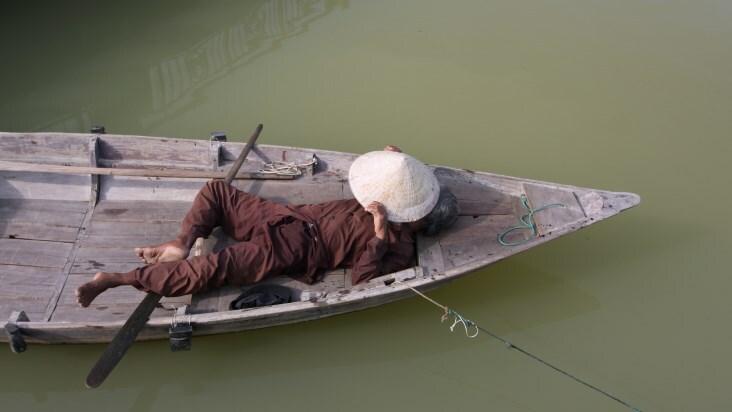 Hoi An: For those not inclined to relaxing, Hoi An has the most exciting array of activities in Vietnam, from cooking classes, culinary tours, cycling trips, fishing or farm visits, to island snorkelling and lantern making lessons. Hue: Enjoy a royal elephant ride at the Imperial Citadel. Hue: Kayak down the Perfume River at sunset. Hue: Explore the countryside via a driving or cycling tour, learn about Hue royal cuisine in a cooking class or culinary tour, or discover the Vietnam-American war DMZ. 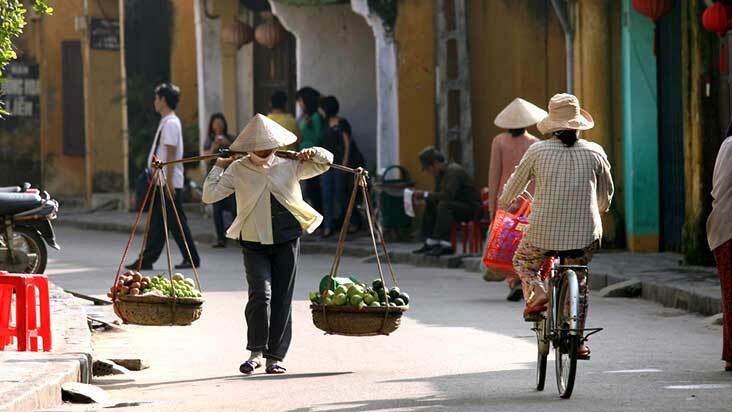 Hanoi: Tour the countryside with options to visit ancient villages, local artisans and/or Mai Chau hill tribes. 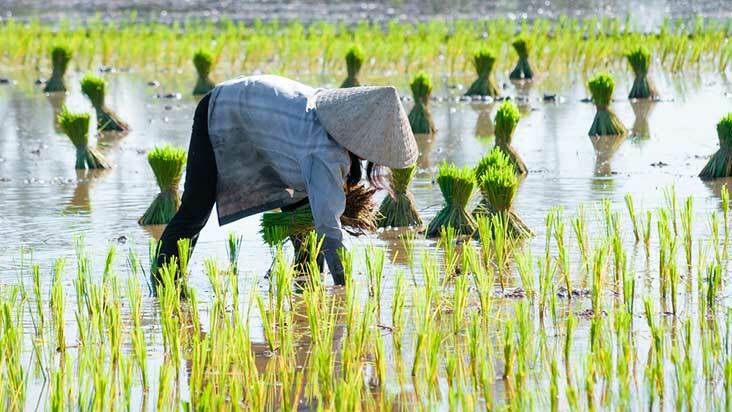 Hanoi: Other options include cycling tours, Van Long nature reserve including a boat trip (recommended), Perfume Pagoda and grotto tour, wildlife tours, cooking classes, culinary tour and art tours. Halong Bay: Why not spend one or two nights on a traditional junk boat to take in the charm of Halong Bay. Check out the Simply Halong Bay Junk Cruise itinerary for details. All breakfasts at your hotel each morning. All internal airfares and transport on tour. All itinerary attractions including fees or permits. Professional tour guides for all airport pickups, day tours and activities. Lunch and dinner as indicated on trip notes. We do not include lunch or dinner where it is practical for you to make your own choices, as we find that GetAboutAsia customers prefer the freedom of eating what they want, which is one the of joys of travelling. This trip package includes 4 internal flights (Phnom Penh - Siem Reap, Siem Reap - Saigon, Saigon - Hoi An and Hue - Hanoi) which retail at about 200AUD per flight. When obtaining your visa you should allow 2-3 weeks for processing, the cost is approximately US$60 to US$100. Check with your embassy or consulate for further details. The Vietnamese Embassy in Edgecliff, Sydney has been known to issue a visa in 4 working days if all the correct documents are submitted at the time of application. It is possible to obtain your Cambodian visa on arrival at the Phnom Penh or Siam Reap international airports or any border crossing for approx. US$30 (cost subject to change) - you will need 2 passport photos.